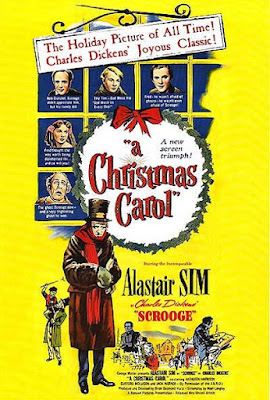 It's time to visit Christmas past, present, and future with Corinne, Polly, and Tim as they watch the 1951 version of A Christmas Carol starring the incomparable Alastair Sim. The discussion includes a proposed duel to the death over whether Sim is the best cinematic Scrooge ever, speculation that Marley's ghost is trolling Ebenezer from beyond the grave, and the accidental slander of charities. Warning: Contains explicit language, spoilers, and a recipe for gin punch. Do you skewer small babies while in your cups? Want to hear the pudding singing in the copper? Did Tim actually say people should 'lick' the Facebook page? Leave a comment and keep the conversation going.